Mesa College following its win on Wednesday. SAN MARCOS (1-31-2019) – No. 13 ranked Palomar College might have defeated 78 Freeway rival MiraCosta College for the 12th consecutive time on Wednesday (Jan. 30), but this time, the result was far from typical. Six years from the exact date of the previous loss (Jan. 30, 2013), the Comets were out of chances until forcing a turnover in the final seconds. The ball then permeated into the hands of Clarissa Taite, who hit a layin at the buzzer to salvage a 68-67 decision over MiraCosta at Palomar Dome. Taite finished with 15 points from off then bench, including five in the final seconds in a clear case of giveaway by the less-experienced Spartans. After Kiva Reyes made a free throw (her only point of the contest) to give MiraCosta a 67-63 lead with 15 seconds remaining. Palomar’s Morgan Heise grabbed the final of her game-high 9 rebounds, with the ball reaching Taits on the break for a 3-point basket to move with a single point with 7 seconds left. MiraCosta called a timeout, but on the inbounds play, the ball was turned over with 1 second to play. The Comets’ passer for the re-start wasn’t recorded, but the pass was made to Taite under the basket for the game-winning, upset-avoiding bucket. Julie Saelee led Palomar (17-6 overall, 3-1 PCAC) with 18 points, while Dee Dee Valenzuela matched Taite with 15 points. Meanwhile, Taylor Williams tallied 8 of her 10 points in the fourth period. In the third quarter, Palomar held ann 18-point lead at 45-27, but a 30-7 run over an 11-minute span by the Spartans allowed the guests to mount a 5-point advantage 57-52 with 6 minutes left. Includied were consecutive outside shots by Victoria Wilson to secure a 53-50 lead at the 7-minute mark. For Wilson, her 22 points from off the bench was a career-high; she scored in double figures just one previous time (18 vs. Southwestern in a non-conference game in November). In addition, Britney Jarvis added 11 points for MiraCosta (13-6, 2-2 PCAC)), while Chynna Cochran and Julia Iman each had 10 points..Notes: While Palomar has been ranked in the CCCAA poll all season, this was MiraCosta’s first entry on the list, picking up a single voting point — thanks to that person who properly noticed… The last Spartans win in the series was also a buzzer-beater, 59-58, at Crosswoods Gymnasium in Oceanside. Imperial Valley 72, Desert 42: At Imperial, Lady Arabs forward Destiny Salgado is fast making a bid for the PCAC Player of the Year Award out of the South Division with another standout performance. After collecting a rare 20-20 double-double in her previous outing, the sophomore just missed the accomplishment on Wednesday (Jan. 30), finishing with 25 points and 19 rebounds (11 on the offensive glass) in Imperial Valley’s romp over visiting College of the Desert. Salgado’s numbers are as good as a pair of former all-state players out of the PCAC — La-Koi Wooten (Palomar 1985), who later became a famous rap artist in New Zealand, and the late Janine Phillips (Mesa ;83), who led the Olympians to a berth in the state championship game before barely falling to undefeated Fullerton. Also for Imperial Valley (11-10 overall), Keren Hogue logged 14 points, 8 boards, 6 assists and 6 steals to subdue the Lady Roadrunners (1-18 overall). Southwestern 79, Grossmont 69: At El Cajon, a streaky game saw the host Griffins lead by 5 points in the second quarter, then the Jaguars mounted a 20-point, third-quarter cushion before hanging on late in Wednesday’s (Jan. 30) PCAC South Division ballgame. Grossmont held a 27-22 advantage midway through the second period, but Southwestern answered with a 20-1 run over the final 4 minutes of the half. The streak started with a with a pair of triple by Satera Bates, who registered 12 of her 22 points in the quarter. However, the Griffins opened the fourth period on a 7-0 run. Satori Roberson scored twice from inside the paint, then Drew Menzoda made 3-of-5 fouls hots in move within 57-52. But the Jags answered with their own 8-0 run to clinch the victory. For South Division-leading Southwestern (12-8 overall, 3-0 PCAC), Chiara Mattern drained 8 triples to register a career-high 30 points. In addition, Maya Robinson added 10 points and 11 rebounds. Grossmont (4-14, 2-2 PCAC) guard Chiara Mattern also recorded a career-best 30 points, but with “only” 4 triples to pace the G-House. Mendoza finished with 20 points — just tw shy of her career best — while Roberson added 15 points and 9 boards. San Diego Mesa 48, San Diego City 38: At downtown San Diego, in a ballgame that was mired by a lack of offense by both remain winless sides in PCAC South play, the visiting Olympians finally found the basket in the final minutes to break open a see-saw affair. 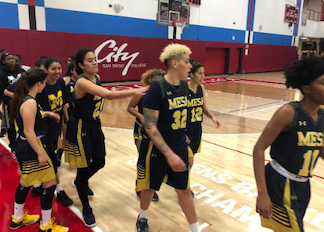 City held a 31-28 lead through three periods, but Mesa tallied 20 points in the fourth to slowly pull away when Yusra Gharram scored 8 of her 24 points — the forward scored half of Mesa’s points. Gharman just missed a triple-double, adding 17 rebounds and blocking 9 shots. Also for Mesa (5-14 overall, 1-3 PCAC), Aaliyah Williams also posted a double-double with 14 points and 10 rebounds. For City (8-13, 0-3 PCAC), Mariah Wonders led with 10 poi. Elliott Nixon added 9 points and 10 boards, while Kaylynn Cooper had 7 points and a team-best 12 boards. The ballclub’s combined field-goal shooting was 25-for-114 (21 percent) and there were a composite 69 turnovers in one of the poorest outings since City moved its game from across the street at San Diego High School to the new Harry West Gym. San Bernardino Valley guard Emani McMeans opened the scoring with a 3-point shot in the opening 52 seconds, The Wolverines would not score again until it was 38-3, when Princess Smith hit a triple 1:02 into the third quarter — a shutout span of 20:10. No official record is kept, but it’s safe to say the shutout streak is a conference record. Through three quarters, Mt. San Jacinto led 52-7 and needed another shutout quarter to eclipse the Southland record of eight when Los Angeles City fell to Santa Monica in 1981 (112-8, then later 120-12). For the first-place Eagles (18-6 overall, 3-0 PCAC)), Haylei Janssens had 17 points and Alyssa Walton had 16, both in just 20 minutes of action. SBVC (4-14, 0-3 PCAC) saw McMeans collected 75 percent of her team’s scoring with 15 points. The remaining points came on a pair of Tyease Bryson free throws.